If there’s one subject that intimidates homeschoolers, it’s math. We homeschool moms love us some humanities: literature, history, geography, Bible. We will attend workshops on these subjects, spend the lion’s share of the budget on these subjects, and fill most of our schedule with these subjects. But we often treat math as a necessary evil. And usually, our students pick up on this perspective. But math is important. Of course manipulation of numbers is necessary for many life skills, but math also teaches accuracy and logical thinking and mental grit. Math is the foundation for the higher sciences. It is related to music and has its own form of beauty. And ability in math is the key that will open more future options for our children than any other in the academic realm. *So the first thing I have learned about math is that it is a remarkable creation of God that is worth learning, no matter your profession. Not all of us will get to the same level, but we all can learn some math, and learn it well. I think this concept of learning something because we believe it is valuable will become increasingly important as technology takes over our world. Many educators (and homeschoolers) already ask, “Why learn [X] if my device can do it for me?” It’s a good question to think about. *The second thing I have learned is that math must be taught in a way that is developmentally appropriate. Mathematics is very abstract. Children’s brains are not naturally adept at handling abstract concepts. Old wisdom understood this, and through most of history you do not see children studying formal math. Yes, it is possible for them to learn some, but it tends to be laborious, poorly retained, poorly understood, and usually leaves a bad taste in their mouths. There is much more that I could say, but in the interest of moving on, I will just point to some interesting resources at the end of the post. Basically what this means is that I do not begin a formal math program before third grade. If I were braver and didn’t care about critics I would start even later. It also means that I do not begin algebra (mostly) before ninth grade. Algebra is highly abstract and the brain is better equipped to handle it after puberty. The current trend of early algebra may sound impressive but it does not have impressive results. *The third thing I have learned about math is that it should be taught systematically. Math is a beautifully ordered system. There is much passion today in educational circles for communicating the underlying concepts of math to children. This has resulted in a lot of convoluted methodology. I will tell you a secret, shared with me by an old math teacher and confirmed in my experience: the way to get students to really understand math is to present it incrementally, one concept at a time, building on the previous in a logical, linear fashion. What does this mean practically? No spiral curriculum. Spiral math is a relatively new idea that came about during the “New Math” fiasco of the 60s and 70s. Spiral math takes several different concepts–often unrelated–and jumps around between them. The idea is that reintroducing concepts over and over will create retention, but the math scores have not proven this out. Unfortunately most math curricula produced since the late 60’s is spiral. Those of us who swear by vintage math books are not really nostalgic; those books are pedagogically brilliant. *The fourth thing that I’ve learned is that math is a skill subject that must be mastered. What this means is that every student should go at his own pace. Do not move on to a new concept until the current one is completely grasped. (This is another strike against spiral curriculum, since it cannot be used this way.) So many problems that students have in higher math would not exist if they were allowed to stay with a concept until they truly learned it. Re-do lessons if necessary. Make the curriculum your servant, not your master. It may seem to put your student behind, but they will be ahead in the end. What about manipulatives? Many math programs exalt the use of manipulatives. I myself was insistent upon them as a new homeschooler. But now with some experience, I have found that when you wait for developmental readiness, manipulatives become unnecessary. I will occasionally use some edibles for an informal lesson with my little ones (see Landry’s booklet on Chocolate Chip Math), but they are mainly for providing a fun association with numbers. A good curriculum will use simple illustrations to introduce a concept and I find this to be enough. Yay for less clutter! Can my child learn to love math? We all want our children to love learning, but math is usually at the bottom of the love-list for our kids. Don’t be discouraged. Math is similar to music, in that you need to tough out the learning curve before you can experience its true joy. Most accomplished musicians who love their art would not have given you the same opinion when asked as a child practicing their scales. I once heard a mathematician say that you should not decide whether you like math or not at least until you have learned algebra. One thing that all students should enjoy is succeeding at math. I believe Andrew Kern has said, “None of us really hate math. We hate not knowing it.” This is another plug for mastery learning. If your child is being pushed too fast through a program, they will never arrive at the place where they find math achievable. They should be getting to the point where they take pride in a paper that receives a high score. Success begets success. And do not underestimate the power that games have to teach children math in an enjoyable way. I heard one mom say her kids learned more arithmetic playing cards than through any curriculum. There also are games created specifically for enriching math skills, such as Muggins Math. I am not a mathematician by any stretch of the imagination. But my own dismal math education has motivated me to find a way of excellence for my kids. As a homeschool mom, I can say these four principles have revolutionized our math experience. 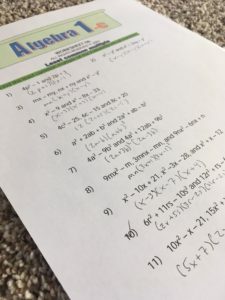 I hope this post will help lift burdens, of both parent and student, while at the same time raising the importance of mathematics in your perspective. It is, after all, one third of the 3R’s and one half of the quadrivium. It deserves a prominent place in the curriculum, both classical and modern. One of the curricula that we have used with these principles is Systematic Mathematics. I was going to do a separate post and review this curriculum, but have just found out that the company is shutting down for awhile and will only be taking orders until December 10th, 2016. SM is a video-based, non-consumable curriculum with worksheets that you print off of a CD. Friendly font, lots of white space. It covers grades six, seven, Algebra I (largely an intro) and Algebra II (much of traditional Alg 1&2). They also have a “Math Rescue” program for teens and adults which lays the foundation for mathematical understanding up to Algebra. The pic above is from SM. This is a very solid program which students can go through by themselves, and at their own pace. So if your children are getting to middle school, and math is becoming overwhelming or curriculum options confusing, check this out.